For several months, The Alliance Office of Statistics have been tracking and monitoring up to 20 seperate accounts that have been using automated scripts for station services, flight and travel from system to system. Collectively this has been used to undermine Powerplay powers and player faction BGS operations. The Alliance Office of Statistics and Mahon’s Powerplay has been under attack from bots since June 2017. These automated accounts are sophisticated, are now aware of current detection methods and are near impossible to counter without robust action from Frontier. This is an epidemic that is likely more widespread than people are aware. In the following, we will outline how the bots were detected in the section “Suspicions raised from behavior” and how BGS and power players can detect them. Further down the line we also suspected that the bots scripting was not sophisticated enough to differentiate between Open, PG and solo. They've since developed that capability so it seems since we alerted them to our awareness though the FDev reports. In May/June last year our home system came under a BGS attack. This was eminently an attack by design, not by accident, specifically targeting Alliance Office of Statistics (AOS) assets and systems. The attackers adopted the anarchy faction and, without our noticing, took surface installations with large pads as a base for their push through trade and exploration data influence gains. Once they had established a foothold in the system, they pushed up the anarchy faction in an attempt to remove AOS as the system owner. This is made evident by the below graph. With Blue being our faction (AOS) and green being the first minor faction to attack us (Gateway Jet Brotherhood), this shows the gradual push for Jet brotherhood who began their push mid June, until they eventually forced war in August. The Anarchy influence rose and peaked during the pend before the Non-combat activities block kicked in. We won the ensuing war by a landslide and took one of the 2 surface ports, and never heard from the Anarchy again. Whoever was attacking switched strategy. We assumed it was a player faction messing with us. For the past year The Alliance has been suffering from continued 5C attacks on its Powerplay. The continued strategy is one that most power players will find very familiar. Every week for the past year, we experience good consolidation vote numbers before the wednesday night in advance of the powerplay cycle tick. All at once a wave of players vote against our consolidation vote, and we end up going from ~85% consolidation to 75%. We’re usually able to just hang and not prep systems, and if we suspect we won't hit our 75% target we outprep the loss making system that is regularly prepped. That loss making system is Soholia. It is deep inside Mahon’s bubble and essentially hemorrhages CC, the Powerplay currency. Essentially this is a VERY bad system for us to be prepping. Obviously we know of many newbies that join Mahon and decide to prep that system, but it's clear that a coordinated push to take Soholia is being made by some organization of players. By this time we knew we were under attack so one of our members started to scrutinise every unknown player heading through our Home system in an attempt to ascertain the culprits. This included scanning players with Manifest scanners, Kill warrant scanners and Wake scanners to gleam as much information as possible. The CMDRs were found in nearby systems such as Farack, Indaol and also in Soholia, the loss making powerplay system close to Gateway. Now by this time between the system influence caps being maxed every day despite strong opposition, and the odd behaviour, we were certain that these were not human players, and actually botted/scripted/automated CMDRs, attacking us. So we collated the evidence, watched as they pushed against us now with a different faction and waited until we thought we had sufficient evidence to take to Frontier. 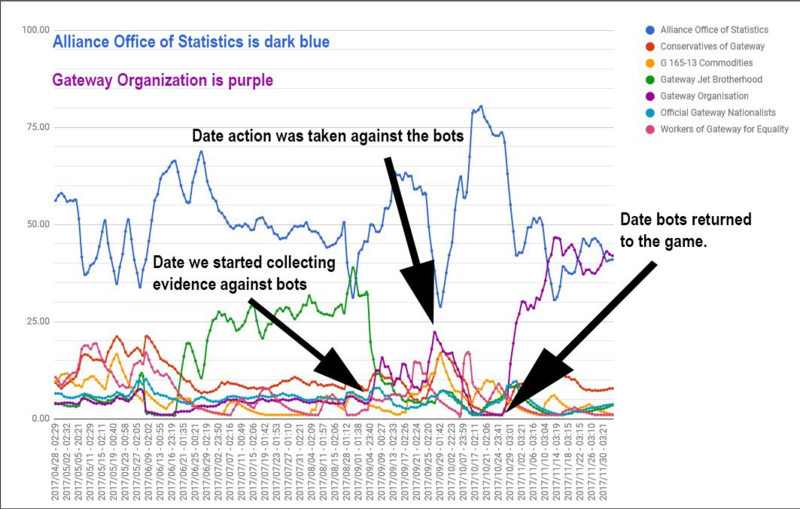 We investigated Bot usage without Client manipulation and found that its not only easy to do, but it already exists. These videos detail the ease with which you can use visual and audio cues to script bots in game. Before we delivered our data to FDev we fought against the bot attacks with our full force of players in our membership around mid september. By this time we were trying to reach expansion in our system but we could never hit over 70% influence. With the numbers we were throwing at Gateway this seemed strange. We were pushing 75-100 high influence accruing missions a day such as source missions, while also using Exploration data to our advantage. Global war and election states were also taken into account for all factions. The Faction pushing against us at this point was Gateway Organisation. This faction is an elective one. The bots are unable to fight wars, it seems they’re not sophisticated enough to do so. Their plan as such was to push a faction that would engage in Elections only where by they only would fight us in trade, and non combat activities. Eventually, a renewed push against us that was even more effective due to lost moral and lost members, we lost most of our influence around late September, which is when we decided to contact FDev prematurely with the small amount of evidence we collected. To be clear this was a horrible but necessary move. This alerted the Bots to our knowledge of them. We were desperate and our faction was suffering. 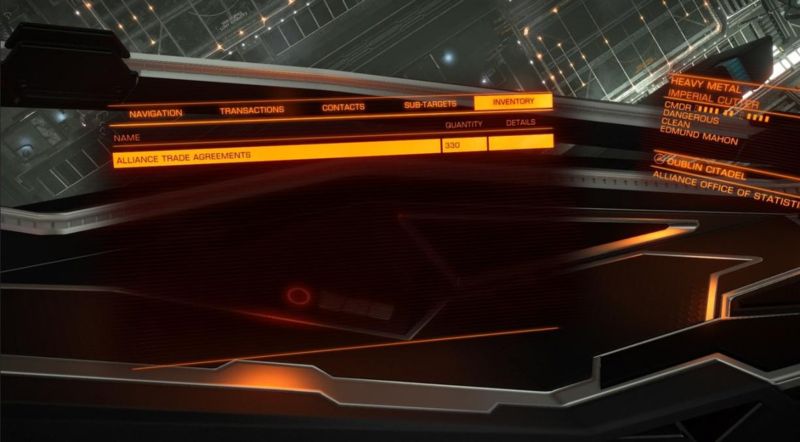 Our rams and occasional scans would have gone unnoticed, but the actions FDev took alerted them to our awareness of them as automated players, and we never saw them departing or behaving as they did in open again. On Monday the 25th, september 2017 we filed a report to FDev of suspected bot and automation activity in the game. The report which can be seen below. And eventually after tracking each day to see if the bots were still searchable in game, we found 2 had disappeared from search, the other 4 were not seen in open, and their continued push against us in Gateway had ended, Our consolidation vote hit 90% consecutively through the next 4 weeks with minimal 5th column preps into Soholia. Followed shortly by the ticket raised being closed. The influence data supported this. 4 Weeks later we saw another push against us in Gateway, by the same faction that we’d previously fought against, Gateway Organisation. They also began attacking our BGS in another one of our systems by adopting yet another elective faction against us. We did end up losing control of this system as a result. The 4 bots we had noted that hadn’t been outright banned started showing up in our recent contacts lists again, parked in Dublin Citadel in Gateway. FDev had soft banned the bots for 30 days. At this point we had 15 suspected bots that included the 4 that hadn’t been fully removed from the game. Very occasionally would several of them fly in open from what we suspected was a mistake in their board flipping script. But generally they would never depart from the Station in open. Their builds would be exactly the same as previously, Anacondas or Cutters, Cargo racks with shield generators and boosters. And a docking computer. 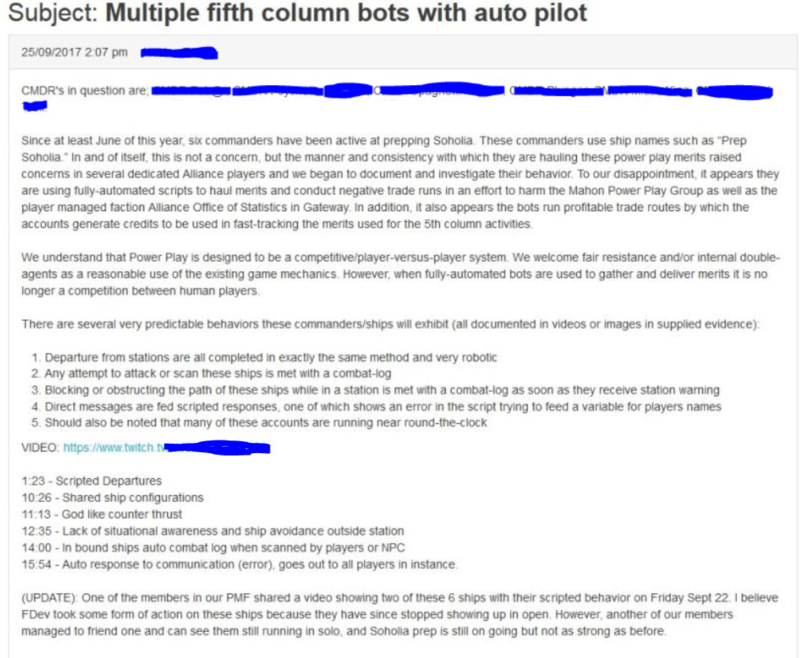 The Commanders names were all troll names still as well as the 4 original names we reported. Gateway Orgs, influence spiked again with a renewed attack, near identical to the previous attack, and we started losing our prep/consolidation votes with us counter prepping a easy to avoid system. 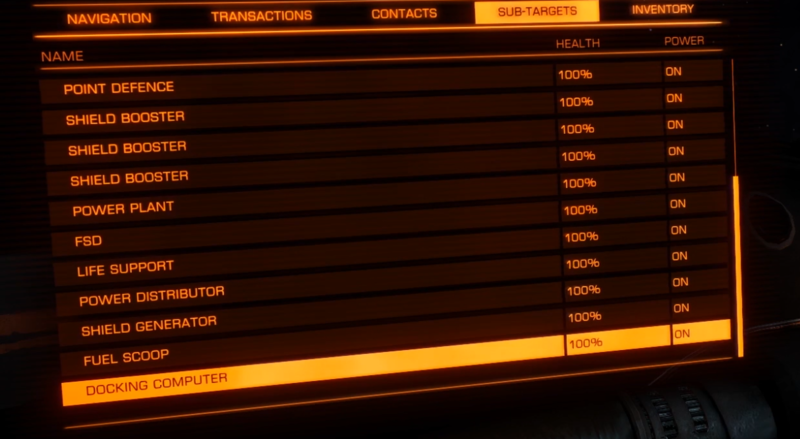 We began trying to collect video of the new bots (included in original linked video) and eventually filed a new report to FDev around December 12th. This report was a long exchange back and forth with FDev as they did a thorough investigation. They asked questions, we provided what answers we could. This chart represents when we started tracking Soholia preps on cycle 121, cycle ending 21st september. We started tracking in anticipation of action from FDev and they delivered the following week. Here you can see a drop in the final number of recorded merits in Soholia preps for the 4 weeks. 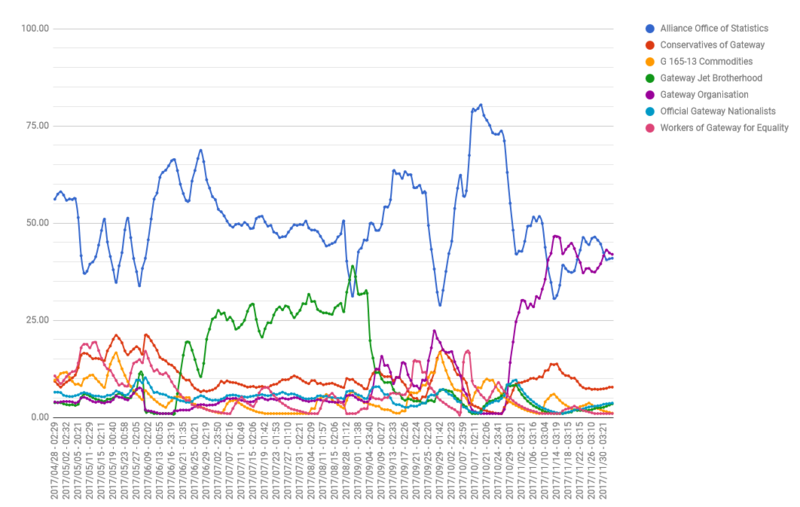 The first drop seen was during the perceived grace period of the bots 30 day ban, with the first rise seemingly indicating they had returned to prepping Soholia. The following rise can be explained by the bots losing their rating over the 4 weeks or altogether during the ban, they then slowly worked their way back up to rating 5 before the second dip on cycle 137 which was the second wave banning following a second report to FDev. The cycle of incremental increases after each ban continue to this day. By January we were fatigued from being hit so hard with no action from FDev and we gave them a message; if something is not done soon, we would have to go public with the bot crisis. Two days later, all 15 bots were absent from game play and our BGS and Power Play returned to normal. 30 days later, 5 of those bots returned in game and started hitting our PP and BGS again. In January we began detecting a push again, in the same system they were attacking us in. One of our CMDRs parked a ship outside the main station and began observing new CMDRs board flipping, all in T6 ships. Many with similar troll names to the original bots, all Mahon pledged, all near identical loadouts. We do not know how many, but the suspicion is strong that while the bot owners were banned on their 15 accounts, they purchased new ones. These ships were occasionally successfully scanned while board flipping, and observed to be carrying PP prep papers, and passengers. These new accounts AND the 5 senior accounts continue working against our Power Play and BGS to this day. They will only earn money and rank and rep at an expedited rate with their 24 routines. We expect to see them in T9s soon once they have the credits. January FDev held a sale on accounts at a highly discounted rate. This was during the 2nd 30 day ban wave against the 15 bot accounts. Further down the line our battle extended outside of just gateway and to this day continues across our systems, as well as the maintained attack on our powerplay. Over the months we developed techniques to counter the bots in BGS strategies, mostly by our understanding of how the bots operated. Blocking wars were our main counter, as the Bots cannot engage in wars for obvious reasons. Since all the bots ran applications that reported CAPI data to Third party developer services , and were not using them anonymously , we were able to track their movements. (Their usage of these tools help the bots track their own location in addition to Journal Data, as well as keeping markets up to date to know what best or indeed worst to trade between stations). We tracked the bots and their target systems, countering their movements and putting resources in where needed. This continued from the end of september up until February before 3.0 where the submitter identifiers were changed to randomised anonymised identifiers that change periodically. With that we have no way of accurately tracking them further. We still fight what we believe are the bots, we still occasionally spot them board flipping and have no reason to believe they have given up their fight. The tactics used and the sheer scale of influence they move regularly indicate that despite us not seeing them in open unless they board flip, they still push against us and our struggle continues. FDev, This is hugely frustrating for the player base, we’ve demonstrated that the issue is widespread and now we’ve raised awareness I'm certain you’re going to see more stories like this one pop up. What we want to see are better tools in game for detecting this kind of play. STOP SELLING THE GAME FOR £5! This is fueling the epidemic! You sell the game regularly at that price it makes it easy for these people to buy Powerplay and BGS ready accounts. All the Bot users need to do is program in a money making route and they can influence the BGS to no end. Your game is one of a kind and it's disgraceful that people abuse it. This needs fixing ASAP. Every week for the past week, we experience good consolidation vote numbers before the wednesday night in advance of the powerplay cycle tick. All at once a wave of players vote against our consolidation vote, and we end up going from ~85% consolidation to 75%. That's a lot to take in! Great work! Interesting read, amazing that people would go to such lengths (spending actual money for accounts) to influence a game this way. Just one thing to help me understand: I don't get why those bots would even fly in open, making it easier to spot them, why is that, why not just keep them in solo? This is why a Spreadsheet as well as players handing in things they've done to the spreadsheet helps to detect a 5th Column opposition. There is no other reason why Gateway Jet and Gateway Org experienced the boom they did when we owned the Dublin Citadel pads unless it was an organized and highly concentrated effort to undermine us. Evidenced further with automated behavior by CMDRs holding Soholia Prep Papers, this undermining effort is nonhuman. Good question and thanks for reminding me to add this. I don't actively engage powerplay and I don't actively engage BGS, but for once I'm fully on the side of these commanders. If they can do this investigation without the tools while FD blatantly ignores it I can only think how ashamed FD has to be, and they better be. Not really surprised, although IMHO the Title "King of divine intervention & cheating" remains unchallenged. FDev. Has always been the most hideous and toxic enemy to the BGS Players, although I possess no data related to PowerPlay (apart from the known issues such as preventing Powers to fail or "insta-repair" some at will in the past that should otherwise have long collapsed). From the original crude overriding, direct Server manipulation, "special status Systems" that Players only ever get info about months later (after slamming their heads into a brick wall for no visible reason), arbitrary and convenient closing of Black Markets for some Factions (non-PP related) all the way upto FDev using Dev Accounts to cheat & directly influence the BGS (lower motives/personal issues). Compared to these malicious actions, even Players outright scripting Bots seem almost harmless. Quite pathetic at best. After almost 3 years deep into the BGS, I think I've seen it all. This is a serious issue, and AOS/Mahon PP can't possibly be the only victims of it — they're just the ones who happened to spend the most time investigating it. Who knows where else bots like these are wreaking havoc? FDev's light-handed response to botting puts the game's fundamental integrity at risk. Soft bans only issued when CMDRs meticulously document automated activity just isn't enough. Forcing bots into solo/PG isn't enough. FDev really needs to introduce stronger countermeasures to prevent this kind of activity. OP : I feel you. But bots and cheats are always been in MMO, since a long time. After, with more or less success I agree. More grind you will have, more bots you will have. Logical. Bring some emergent content to PP and then it could change. i find the bots are quite a feature in itself, and i can very well understand how someone can invest time into them just for the fun of it. some people spend hours developing tools for the game that frontier should have implemented themselves, so not so strange after all. otoh, in case it is really about gaming the bgs you could see it just as a variant of 'play it your way'. i see no fundamental difference between a bot and a cmdr behaving like a bot, doing grind loops. if gameplay is so easily automatable then that's what you get. of course frontier needs to address this, if only for pr reasons, but that's a cat and mouse game. the only real solution is to generate gameplay that is not automatable. we face the same problem irl with job loss due to more and more sophisticated algorithms, only solution is to adapt and reinvent. Bring some emergent content to PP and then it could change. Speaking personally (no AOS consensus exists yet on the true fix for this), i'd love to see that. Things that require more complex and more effort driven gameplay are the answer. Seeing how much of x you can do in y time is lets this kind of thing fester. Seeing how well you can do x over y time is better. Some people take video games a little too seriously. Edit : to clarify I mean the people running bots. Not the OP, the video is very convincing. You may as well ask FD to stop selling the game. Or shut down the servers. Preferably with Mahon at #1, so you can go down undefeated. Did you really have to make us scroll through the long OP again? Re: OP, kudos for you guys doing the investigative work. To me, botting is a lot more serious than combat logging and soft bans seems like a joke, especially when these accounts were made solely or this purpose. While they may not want to refund them, it certainly doesn't send a strong message to potential botters that the worst that could happen is a temp ban. Fdev, show us you have cajones! Take action! Some powerplayers take this game too seriously to be taken seriously. It may not matter to you. That's fine, I respect that. It matters to some, maybe not most but a good proportion. Mahon has been advocating for a changes to PP that actually makes our position more precarious than it is now. The powerplay mechanics have reached their natural equilibrium and needs an overhaul. That doesn't mean you can cheat the current grind mechanics. Could you email community@frontier.co.uk with all of the commander names that you suspect of botting/cheating/economy manipulation? Will follow up with customer support and our anti cheat team on this. Thanks! Mahon has been advocating for a changes to PP that actually makes our position more precarious than it is now. JPG and several strings of code can't advocate for anything.